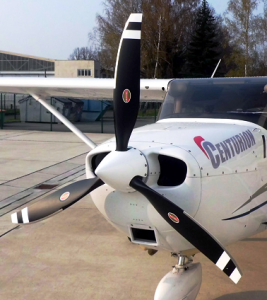 Hartzell has announced its second STC approval of 2014, a high performance composite propeller for Cessna C-172 Skyhawks with diesel engines. The approval provides for the installation of lightweight 3-blade Bantam series propellers, along with lightweight composite spinners, on Skyhawks running the geared diesel Centurion engine. The carbon fiber structural composite technology of the Bantam blades is substantially stronger than a wood-core propeller. The added strength allows the carbon fiber prop for the C-172 to be made thinner. The resulting propeller is both stronger and safer than older propeller options available to Skyhawk owners. The Bantam Series is chiefly designed for performance, but installing a composite prop is also a wise financial decision: Bantam 3-blade composite propellers for the diesel Cessna C-172 Skyhawk are rated for 2,400 hours between overhauls, unlimited blade life, and are backed by Hartzell’s industry leading 3-year/1,000 hour warranty. The Hartzell team is proud to introduce this cutting edge propeller. The Skyhawk is a great plane, and the Bantam composite prop should push it’s performance further than ever before. To get more detailed information on the new Bantam composite 3-blade propeller for the diesel C-172 and its effects on performance, read the official press release.